In the heart of this village of startups people can meet an work together in the co-working space. PLANQ designed and made the coffeebar and tables in this space by reusing old burlap coffee bags to create sharp designed furniture. But even more.. An environmental aware story to create awareness about the benefits of leftovers. Startup Village is a new community working space at Amsterdam Science Park where the most innovative high-tech and science based startups will be hosted. 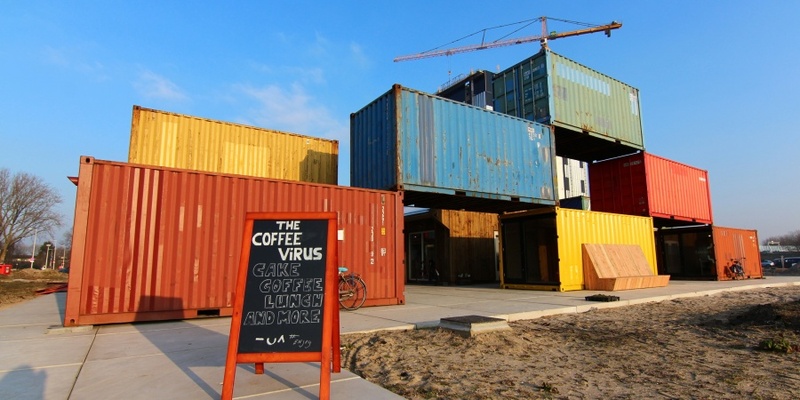 Startup Village is an initiative by ACE Venture Lab, Amsterdam Science Park, UvA Holding and Julius Taminiau Architects. Right now most of the coffeebags that enter the Amsterdam harbour got burned. But 65% of it is still interesting for recycling. We reuse these leftovers into valueable products like this and show the endless possibilities of it. The Coffee Virus nested itself in the center of this village and creates a crossroad where people got connected and change their mindset with great coffee in a inspiring environment! Interested in how we might help you creating environmental awareness by reusing leftovers? Just give us a call or send an email!